Thank you so much for visiting, following and reblogging. This is such a great honor for me. I like your thought provoking posts, thanks. Wait, I don’t believe that. Wait, I don’t believe that I don’t believe that. Wait. I don’t think I feel as though I believe I feel that I think I disbelieve this. That’s a good one, I’ve got to remember that one. I keep getting this message, from many sources, which makes me trust it. I’m wondering if you’ve ever read any Byron Katie? And then you can turn your statement around., and often times, the turnaround is more true. Thanks for this post, and reminding me to keep questioning my thoughts. Yes I think that Byron Katie basically speaks about the same thing. She is a smart woman indeed. Oh my goodness, you speak my language! Thank you sooooo much for reblogging this.. Very Very much appreciated. Eckhart Tolle has written beautifully about the need to stop identifying our selves with our minds/thoughts in order to achieve enlightenment/peace. The Power of Now. I am looking for a “follow” – button, and did not find any -? I don’t know sometimes it seems like believing your thoughts and going aggressive for what you think is right, is the right thing to do. Indeed…this is all there is. Thanks Ido, it’s a pleasure you stopped by my blog, It’s been wonderful exploring yours! Great blog, Ido. This reminds me of the movie “What the Bleep Do We Know.” Your thoughts, although intangible, are more concrete than the physical in many cases. Let those thoughts go! It takes time but you get better. This is such a wonderful blog… Love what u have written.. Turning off the Internal Dialogue is the only way I know of to control the thoughts that we have. Once achieved it opens you up to a different Reality. You see things without the description, the way they really are, energy! However turning off the Internal Dialogue is not an easy task. Most people don’t realize that they can stop this chatter inside their heads but It can be done. Try this the next time you go for a walk. Look at the horizon and try to see the full view from the side of your head forewords with out focusing on any object in your vision. Now hold your pinky fingers on your hands and thumbs together something like in yoga. Start walking! Try not to break the vision (It’s kinda like a stare) and listen to everything as you walk. It will take some practice, and patients but the Internal Dialogue will slowly diminish and things will start to change before your every eyes. This is when you know you are doing it right. Keep practicing, you will be amazed. No more chatter. True perception! Hi Ido, thanks for stopping by my page The Brainwash Project! I’ve had a look around your blog and I really like what I’m reading. Would you be interested in potentially writing something about thoughts and the mind for the first edition of Brainwash Magazine? 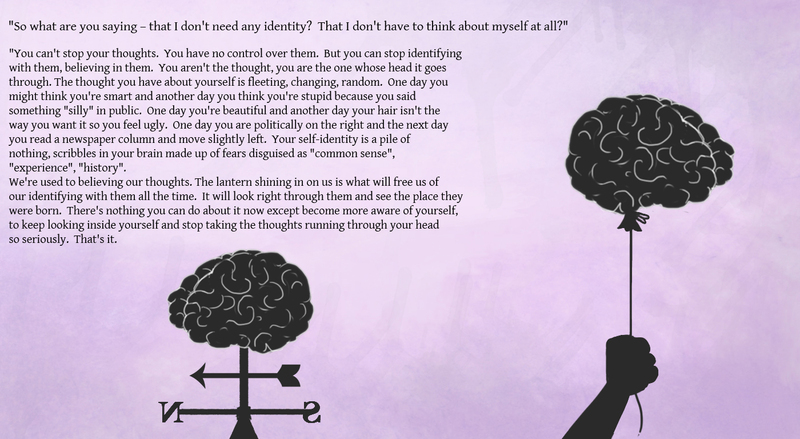 You can check it out here: http://www.pozible.com/index.php/archive/index/7913/description/0/0 or email me: thebrainwashproject@gmail.com. Great blog, Ido, it really is empowering to know you’re not your thoughts. This is so true. I often have to stop and ask myself, “Why am I thinking this and feeling this way about myself?” You’re right. Thoughts are fleeting and easily provoked by others. But knowing that is the best way to not let them control you. Thanks for a great post, Ido. My thoughts have run the show for so long now that they don’t like the suggestion that they might not BE me. I have a fight on my hands – but I’m up for it!! It is a good thing when you see your thoughts – it’s the awakening of the awareness. Reblogged this on Don Lucuis' Chronicle. I think you’re right about this and thoughts enter our head from all over, we file stuff when we’re not focused on it, even pick up on other conversations that may not be our own. There is an influx of stimulus coming at us every day so a wave of thoughts. So you’re right, we don’t have to take everything as an indicator of who I am. If you watched 5 horror films in a week and have a flash of blood pouring down a face – it doesn’t now mean “I’m violent!” This probably works with food, drugs, alot of things (even though that may take more practice). Anyway, I believe the mind can be turned around. The matrix wasn’t just a movie to me. Haha. It can definately turned around, there’s a great book about it called “The brain that changes itself” – totally scientific, but written in a very simple way so that everyone can understand. That is an interesting thought. Do you believe it? Why should you believe that one? Why should I believe the garbled version of it that is now in my head? Your description may well apply to some of our thoughts, or even most of our thoughts, but just possibly perhaps not all of them. If all of our thoughts were inherently untrustworthy, why would I hear the ring of truth in so many of yours? Why should anyone bother to share them? Does our search for truth simply come down to disbelief in everything we can imagine? And what is the alternative? What should we trust instead of our thoughts? Our emotions? Our intuition? Epiphanies that arrive in profound, ecstatic flashes of insight and enlightenment? They are all thoughts as well. Peace, and thanks for providing such wonderful food for thought. I can actually say many things now in defense of my claim. I can say that “there is no me and therefore there is no one that thinks”, and Ian say stuff like “In some point of the process they all dissolve” and so many other “smart” sentences. In the end it is my Ego talking, trying to convince that I am right. And it is ofcourse only thoughts. Enlightement, Awakening, Spirituality, Progress… All appear in the mind. You are totally right about it. “Think not-thinking” is a zen meditation excersize which aims to rid our brains temporarily of the racing & buzzing thoughts in the hive of our heads. I kind of like that idea. “Nothing is seen that was not first unseen.” was a cool concept about thought I heard at a management seminar. To wit: the imagination is the birthplace of invention. Before we could physically see a telegraph, light bulb, locomotive, airplane, radio transmitter, cell phone or space craft, it was first unseen, in other words, existing in the imagination of invention in the mind. Really good post… While I was reading it I actually felt like it is just written for me! It is so true… Everyone knows that we should not believe our negative thought but it is quite tough to stop thinking that… It is quite frustrating too!! It’s kismet or something, you liked a post of mine and I came to read more about your blog. And, so much of what is here is exactly what I need to HEAR. Funny. Thanks for sharing and for visiting. There’s truth and then there’s fiction. Don’t mix them up, but if we don’t believe in something, then we are nothing. Well there’s nothing to replace them with. ALL thoughts are just thoughts. That’s it, this is what they are. Try becoming more aware of them, you can do this in various ways, whatever works 4 u. It is not a few days process. When a “bad” thougt or feeling arise, you can just take a pen and a paper and write it down, than start investigating it – “why are you here? Where did you come from? What are you here 2 say?”… whatever works. If u really want to do that, you will succeed. It’s really not too difficult to put all thought out of your head for brief periods, like meditation. Go to Armchairzen.com and check the March 2011 archive for a piece titled “Think ‘Not-Thinking'”. It works, but maybe you should try it while not driving! I know I’m late in the game here, but what if my thoughts believe in me. The only “text”, “map”, the navigator to a safer place where I can deal with some of my most destructive thoughts? Amen. The voices in our head are loud and confusing. Love your post… I noticed as a teenager or somewhere around that time that my thought reflected a lot of negative feelings which had very little to do with other people’s reality. I was creating my own, negative, version of the world around me and feeling worse as a result. So I stopped doing that. It took time and conscious effort. Thank you for visiting my blog! Woah! Are these words your own original thoughts? Hehehe! Amusing and interesting. Gotta say I agree to a good extent with you. Glad though that you believed the thoughts (that birthed this post) to be worth sharing. And thanks for the visit to my blog and spreading your colours all over. Hi! I’m so glad you liked my blog so that I did see yours and read such a wise words. You made me a bit more wiser I’ve have never tought about this, thank you. Thank you for this great article! My yoga teacher always says: you are not your thoughts, you only have them (and you can let them go). Hmm. This seems to be the completion and the flip side to 2 Corinthians 10:5, “Hold every thought captive.” Think it, capture it, examine it, release it or claim it, respond. Funny how truth resonates no matter the speaker. To claim it without examining – mmmmmm, not a good idea. I absolutely concur with this post and the very title alone. My philosophy about our thoughts and are belief in them is quite similar. I will one day soon re-blog this post (with your permission of course) with an added comments from moi! Dig your site though. We need more positive vibs in our existence!